When it comes to anthropology, Sri Lanka features a rich heritage that is linked with a traditional way of life. On this 15 days itinerary discover for yourself rich culture and indigenous way of life, old rituals or traditions and enjoy visits to some of the country’s must-see sights and locales of great natural beauty. With a mix of luxury hotels and simpler accommodation options in some of the remoter locations featured, this tour balances out the contrasts by the amazing richness of the experiences on offer. Sri Lanka lies to the South of India in the Indian Ocean. Famous for its Buddhist ruins, It also offers diverse landscapes from rainforest and arid plains to highlands and sandy beaches. Upon arrival at the Bandaranaike International Airport you will be met and assisted by a Sri Lankan Airlines' staff who will hold a board with your name as you exit the aircraft. You are accompanied through passport control, customs, baggage collection and money changers, all the way to the arrival lounge where the Luxe representative will meet you, address any last minute questions you have about the itinerary and introduce you to your private chauffer guide who will be your travel companion and explorer guide around Sri Lanka. Your destination tonight is Negombo. Transfer directly to your hotel and check-in. Located within a fairly close range to Bandaranaike International Airport, Negombo - the cinnamon hub of the Colonization of Dutch - offers some of the most exiting diving stretches in the country. Today, Negombo also boasts of a great nightlife scene with bars, disco bars and clubs making it a very popular destination. Overnight at hotel. After a slow and relaxed breakfast, set out by road to Anamaduwa. The drive is approximately two and a half hours and on the way you will get a chance to visit a community of African descent who were initially brought down to Sri Lanka by the Portuguese in the 16th century. 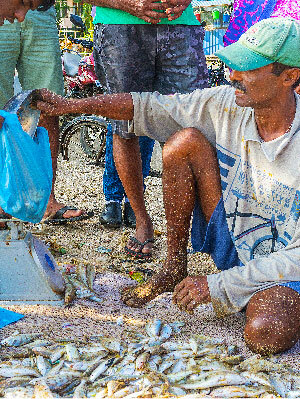 Based in Puttalam, this unique community still have their own distinct culture be it rituals, rites, dance or song. This afternoon, you have the choice of engaging in a fun activity at your hotel; learn the secrets of preparing authentic Sri Lankan dishes with a hands on cookery demonstration or enjoy some kayaking on the lake. 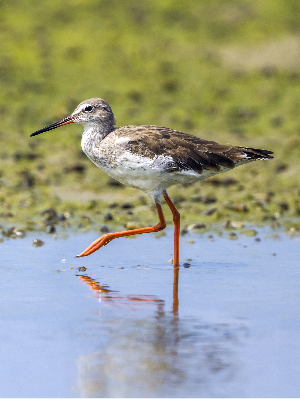 There are good tours for avid birders too. Overnight at hotel. Today, you will depart by surface to Anuradhapura enroute visiting Tambuttegama. The drive is approximately two hours long. 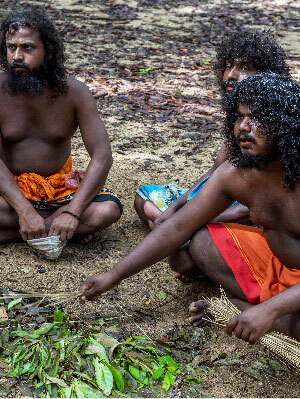 At Tambuttegama you will get a chance to visit the ‘Ahikuntaka’ tribe (Sri Lankan Gypsies). You not only get to see their traditional dwellings but also enjoy a visit to the museum where you learn more about their history. 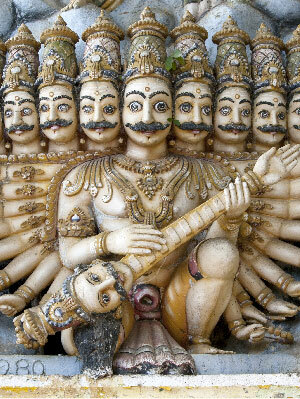 Essentially a gypsy-like community, the Ahikuntaka refuses to dwell in established settlements with others. Your next stop is the UNESCO World Heritage Site of Anuradhapura, one of the greatest and oldest civilizations in the world spanning over 1300 years. Centuries later, it became one of the first, formally planned cities in the world, featuring palaces, worship grounds, cemeteries, monasteries, and water tanks - comprising the most intricate, well-designed irrigation system of the time. 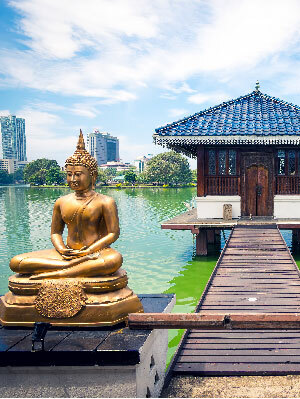 Spend the afternoon discovering the major sights of the historical city including the remnants of the ancient kingdom – stupas, a moonstone, the Abayagiri Dagoba Theravada Buddhist monastery and the Jaya Sri Maha Bodhi, a tree said to have grown from a branch of the Bodhi tree under which the Buddha attained enlightenment. Overnight at hotel. Set off to Dambulla and on the way stop at Mihintale and Aukana. Excluding stops the drive from Anuradhapura to Dambulla is approximately an hour and a half. The first stop on the way is Mihintale, the site where Buddhism was first introduced to Sri Lanka and is therefore regarded as the cradle of Buddhism. There is also a grand stairway of 1,840 steps made of granite slabs 15 feet wide, leads to the summit from where you get a splendid view of the surrounding countryside. A short drive away is the Aukana Buddha statue. 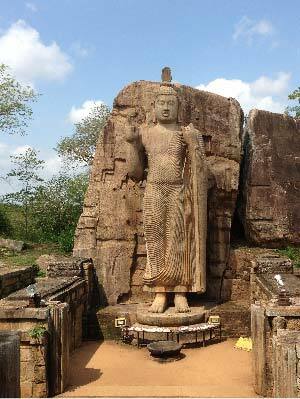 Standing up to a solid 40 feet over Anuradhapura the Aukana Buddha Statue – a creation of King Datusena – happens to be one of the foremost cultural and religious attractions in Sri Lanka spearheading fantastic proof of carvings that date back to the 5th century. After Aukana, continue your drive to Dambulla, the home of the famous and sacred site with cave shrines containing ancient statues and paintings. In the evening, you'll visit Dambulla Cave Temple, a sacred site with cave shrines containing an ancient statues and paintings. There are five main caves, the oldest dating back to the 1st-century BC. Overnight at hotel. 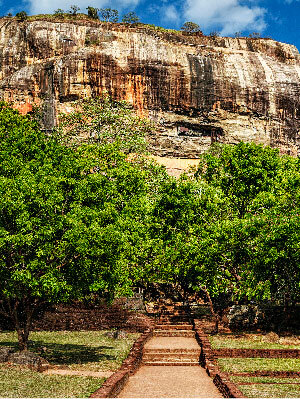 After breakfast proceed for an excursion to Sigiriya - The 5th century rock citadel of King Kasyapa and World Heritage Site, boasts of ancient Sri Lankan engineering and urban planning supremacy and is acclaimed as one of the finest monuments of art and culture. Step through the gigantic ‘Lion Paws’ – overlooking the symmetrical Royal Gardens below – to comprehend the absolute splendor that once dominated this rock fortress. Surrounded by ramparts and moats, The Lion Rock – resembling the mythological ‘City of Gods’ – is coated by frescoes that relate to Gupta style paintings found in Ajanta caves of India. Wander into the museum downstairs for an epic journey of yesteryears to realize how the citadel floated above citizens with the castle, ponds and irrigation systems that pumped water right onto its summit with an ingenious hydraulic system describing a colossal masterpiece of the great king which remained a wonder in Asia for centuries. For lunch, you'll dine in a local restaurant, and in the afternoon you'll see the striking Namal Uyana and forest – the largest ironwood forest in Asia – and the striking pink quartz mountain. Overnight at hotel. After a leisurely breakfast at your hotel, you'll depart for the ancient city of Polonnaruwa – another UNESCO World Heritage Site, approximately an hour and a half away. Here, you'll see 12th-century palace ruins, religious and royal statues, stupas and more. For a proper understanding of the site, you'll visit the Archaeological Museum. 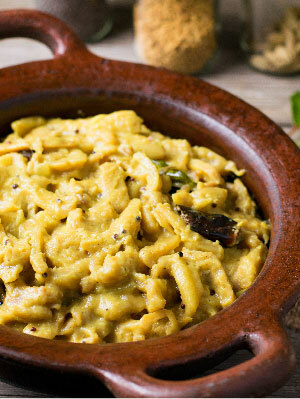 This afternoon enjoy an authentic Sri Lankan lunch with a family in the local village. 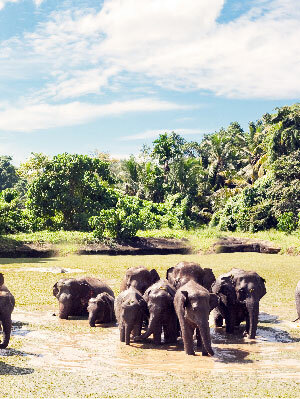 Next, you have the option to take an elephant ride through the jungle of Habarana before you return to your hotel. Overnight at hotel. After breakfast you continue your journey to Trincomalee, approximately two hours away. Trincomalee is a major port city that overlooks the stunning Trincomalee Harbor. Here, you will visit the Koneswaram Temple, a medieval Hindu temple complex that sits atop a cliff at the edge of the sea. Also stop at the popular Kanniya Hot spring water wells, believed to have healing properties. The afternoon is at leisure and the golden beaches and bright blue waters offer a perfect setting for a romantic stroll. Overnight at hotel. Breakfast at Hotel. Today’s sightseeing includes a visit to the Girihandusaya Buddhist Temple, located in the north of Trincomalee, in the small Tamil village of Thiriyai. 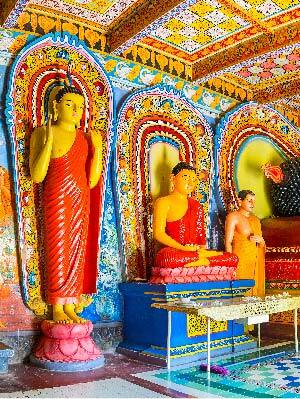 The temple houses what may be the oldest Dagoba – Sinhalese for stupa – in the world. Then, spend time at Pigeon Island, where you can enjoy leisure time exploring the protected coastline here. Pigeon Island is located in one of Sri Lanka's two national marine parks, and is actually two rocky islets – one of which is surrounded by coral reefs. 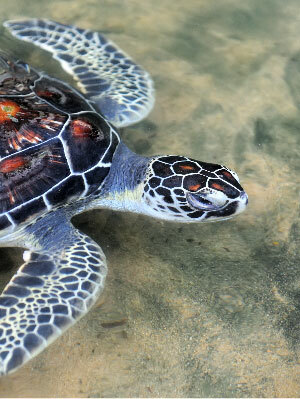 A variety of turtles and rock pigeons call this area home - you may be lucky enough to spot some on the visit. The evening is at leisure. Overnight at hotel. 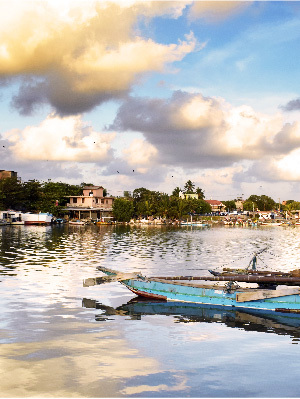 Bid goodbye to Trincomalee and make your way to Passikudah via Vakarai. The drive is under three hours. Vakarai is a small, sleepy town that is home to a fishing community. Small thatched houses with large gardens were the characteristic features of the villages. As you wander through the lanes, it is easy to see that life here is very far removed from that we have grown accustomed to in the bigger cities. Arrive in Passikudah by afternoon. The rest of the day is at leisure for you to enjoy the beach and the long coastline. Overnight at hotel. After a relaxed morning, check out and continue your journey to your next destination - Gal Oya, which is approximately an hour and a half away by road. En route stop at Deegavapi is a Buddhist sacred shrine and an archaeological site, boasting of historical records dating back to the 3rd century BC. The importance of Dighavapi is connected with legends about visits to this site by the Buddha himself, and many allusions to Dighavapi in the ancient chronicles as well as in the Pali literature. After the visit drive directly to your lodge and check in. This evening follow a nature trail with the Veddhas , a tribe reputed to be descended from the aboriginal population of the island but struggling with the realities of the 21st century. They are only a few hundred left but continue to live in the most primitive of mud huts and still follow their traditional way of farming and hunting with bows and arrows. The chief guides you through their small domain of forest and paddy fields and describes the medicinal qualities of the trees and plants around him, most of which are used in Ayurveda treatments. Overnight at hotel. Breakfast at Hotel. Spend the day exploring the wonders of Gal Oya National Park. Here you can take a boat out on to the biggest man-made lake in Sri Lanka, Senanayake Samudraya, have a picnic on one of its islands and savour the sound of silence broken only by birdsong. Watch local fishermen cast out their nets, observe a small herd of red deer catch a glimpse of a crocodile or two as they climb out of the water to warm up on the banks, staying out of the way of the elephants who come down to the water’s edge to take a bath. This evening close out a perfect day with a delicious dinner made from local produce. Chicken or river fish curry with enticing side dishes of beetroot, sweet onion and spicy coconut or hoppers, a rice flour pancake, with egg, lentils are just some of the options available. Overnight at hotel. Breakfast at hotel, the morning is at leisure. 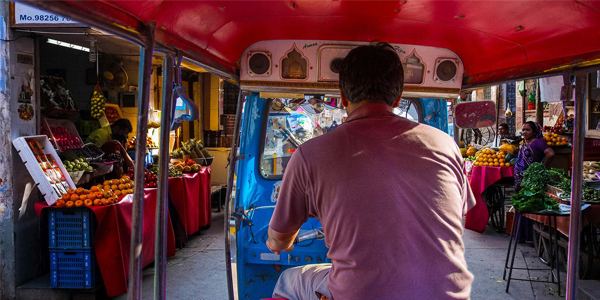 Check out after lunch and a two hours’ drive brings you to Kandy, last ruled by King Sri Wickrama Rajasinghe before it was brought under the British rule in 1815, Kandy is a World Heritage Site and the last Royal capital of Sri Lankan kings. The city offers an array of culture, history and heritage which you will get a chance to discover during your stay here. Overnight at hotel. Breakfast at hotel. Spend the day exploring the scenic town. Start with a visit to the Spice garden followed by a tour of the Kandy Royal Botanical Garden in Peradeniya. Conceived as a Queen’s pleasure garden in the 14th century, and a Kandyan Prince’s residence in the 18th century the gardens were formally opened under their current guise in 1821. Do not miss The Orchid House that has more than 300 varieties of exquisite orchid from the rare indigenous Foxtail and Vesak orchids. 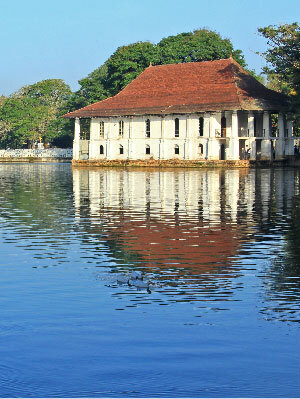 In the afternoon, visit the Temple of the Tooth Relic. 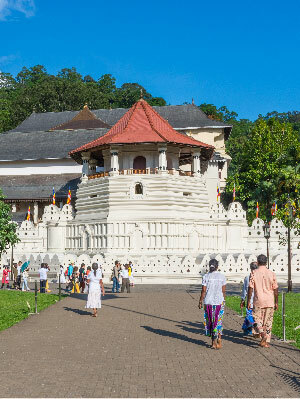 Tradition relates that a sacred tooth relic of the Lord Buddha was brought to Sri Lanka in 4th Century A.D. and was enshrined within the Dalanda Maligawa, (The Temple of the Tooth). This sacred relic has ever since been the symbol of sovereignty for the Sinhalese kings and always enshrined in great splendour. Religious services (pooja) are held daily at dawn, midday, and in the evening and can be viewed by visitors. The services are accompanied with traditional music and drumming. Overnight at hotel. After breakfast head from Kandy to Colombo, the island’s commercial capital and the entry and exit point for all visitors to Sri Lanka. 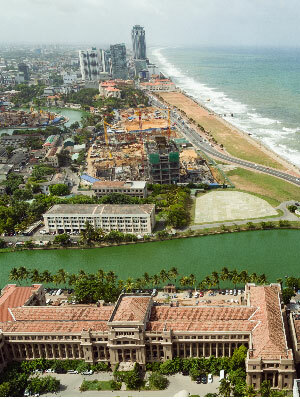 Divided by parks and wide streets with parliament and other government offices still housed in grand colonial buildings this is a charming capital city with some wonderful sightseeing possibilities like a visit to the Seema Malaka temple, the National Museum, Old Parliament Independence Memorial Arcade & Independence Square, the Lighthouse and Clock tower, Colombo Harbor to name a few. Overnight at hotel. Enjoy breakfast at your hotel before your driver escorts you to the airport in time to check in for your onward journey, either back home or onto your next destination. This itinerary offers you only a slice of the many treasures this fascinating island has to offer and we do hope that you will return soon to discover more.